December 21, 2007, 4:38 PM · The older I get, the more I realize how many totally cool jobs simply don't appear on the roster during High School Career Day. For example, scuba diving instructor. Where was the table for that? Even within the violin profession, some people manage to find more unusual gigs. Take, for example, Peter Wilson. When I found out that he has spent his career playing as a violinist in the U.S. Marine Band, I did a double take. They have violins in the Marine Band? Peter and I knew each other as students at Northwestern University, where he was concertmaster of the orchestra, as well as a member of the band. I knew he had a healthy dose of fun and adventure (like me, he also played in the Disney All-American College Orchestra at Epcot)... but joining the military? The more he described it, the more I had to know about life as a violinist who plays regularly for U.S. presidents (and has done so for three administrations). He also has served for 12 years as “The Voice of Marine Barracks, Washington, DC," announcing more than 50 parades and ceremonies annually. Wilson started playing the violin when he was two, and his first teacher was his mother, Suzuki teacher Mary Wilson. Currently, he lives in Fairfax, Va. with his wife, Katie, and sons, Bradley, Gregory and Thomas. In addition to all the military work, he is the conductor of the Waynesboro (Va.) Symphony Orchestra and is an Ysaye specialist (he treated us to some fairly encyclopedic knowledge a few years ago in this V.com thread). He also has teamed with double bassist Aaron Clay, and they've made some fun arrangements that take advantage of the wide range covered by the highest and lowest instruments in the string family. They play for educational concerts and other engagements, and their album, Bridging the Gap, was recently made available on iTunes. Laurie: What was it that made you decide pursue a military musical career? Peter: My violin teacher in high school, Donald Portnoy (then at West Virginia University) had been a violinist in the very same ensemble back in the fifties. However, while I knew he played at the White House early in his career, I was really unaware that he was in the Marine Band and I was even less aware that there were opportunities for string players in the military at all. It wasn't until I was well into my undergraduate work at Northwestern that I really learned about the Marine Band from a good friend and former classmate, Pat Sheridan. He left NU after our sophomore year to attend Arizona State and then promptly won a Tuba spot with the Marine Band. During the spring of my senior year at NU, Pat called to let me know about a violin vacancy with the Marine Band's White House Orchestra and said, "Pete, this job has your name written all over it!" While I was committed that summer (1990) to serve as Concertmaster of the Walt Disney World Orchestra in Florida, it appeared the Marine Band audition would be late in the season and I was able to negotiate a brief getaway from Orlando. Laurie: What exactly is your job, and what has it been, in your years in these groups? Peter: Officially, our job or "mission" is to provide musical support to the President of the United States and the Commandant of the Marine Corps. While our primary commitment is to the White House, we do have a healthy schedule of musical activities throughout the Washington, DC metropolitan region. That includes performing free public concerts (orchestra and chamber music) at local venues as well as performing patriotic openers for non-profit conventions. Personally, I have worn several hats in my capacity as a member of the Marine Band over the years. I have served as Principal Second Violin with the Marine Orchestra since 1991; I am the band leader, fiddle player, and vocalist, in our contemporary country music ensemble "Free Country;" I have been a writer and coordinator of our Music In The Schools program in which we send string quartets to local elementary schools to perform outreach concerts. 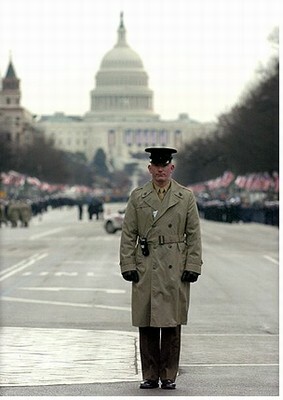 Since 1995, I have served as the official ceremonial narrator ("The Voice") for Marine Barracks, Washington, DC which means I serve as emcee or public address announcer for dozens of parades and ceremonies each year. Just this month, I assumed the duties of Commander of the String Section for the Marine Band as my predecessor will be retiring soon. Our typical White House commitments involve performing in a 30-piece orchestra for state dinners or other formal receptions, string quartets or quintets (sometimes with piano) for smaller receptions or luncheons, and even solo violin, which I have provided at the bottom of the Grand Staircase or up in the "Residence" as welcoming music for guests. Finally, the Violin & Double Bass string duo I have been playing in for over 10 years with my colleague Aaron Clay has been adopted by the Marine Band as an official performing duo. As such, we have performed for the President & First Lady as post-luncheon entertainment for their guests as well as after-dinner entertainment for senior military and government officials around the DC area to include the Chairman of the Joint Chiefs of Staff and the Commandant of the Marine Corps. We also perform frequent outreach programs at area schools. Laurie: Did you have to go through Basic Training to take a job in the Marine Band? Peter: No. Marine Band members do not attend Marine Corps recruit training for several reasons. First and foremost, we already are highly trained to perform our required duties for the Marine Corps (performing as musicians with the Marine Band) and Marine Corps recruit training teaches an entirely different set of combat skills that are not required for our jobs. The majority of line Marines enlist out of high school and are trained over a 13 week period. Over 90% of the Marine Band is made up of personnel with undergraduate and in many cases advanced degrees--having developed their skills over many years. We can never be transferred to a fleet Marine unit and it would be impractical to send highly trained musicians through the Marine Corps recruit training process, risking serious injury. That said, we are all active duty Marines in the Marine Band and we occasionally select candidates through the audition process who have prior service in a Marine Corps field band or another branch of service in which they would have attended recruit training. Laurie: How is your job different from an ordinary orchestra job? Peter: While we do have a public concert series (one orchestra concert each month from January through August), our schedule is significantly different from that of a typical professional orchestra. Due to our commitments at the White House, we cannot schedule the same season of concerts as many orchestras. The job is quite different for our wind and percussion players as they are required to march parades and funerals in addition to their concert and White House performance commitments. Laurie: In your view, what function does live music serve for the military? Peter: It is a complicated question to answer simply because musical units across the board in each branch of service have different functions and missions. Historically, live musical units within the military provided motivation to the troops preparing for battle or they might provide direction to troops by way of musical commands and marching orders. If one were to focus on the bugle calls on a ship, for example, one could see the critical role music plays in the daily routine of getting up in the morning to eating to retiring for the night. When the Marine Band sends its tour band out on the road each fall, it serves in many ways as a recruiting tool for the Marine Corps by representing the Public Affairs Division of the Marine Corps with each performance. That said, when considering that the Marine Band is America's oldest professional musical organization (founded in 1798), it is my belief that we have a duty to preserve the musical traditions of the United States while promoting the old and new music of our nation. When combining this duty with our mission of providing music for the President at the White House, we of the Marine Band truly serve as a living history within the walls of the Executive Mansion. When guests enter that mansion, they view all the historic art, admire the beautiful architecture, and they can see and hear the wonderful sounds of musicians from the Marine Band, who have provided such music since the first performance for John Adams on New Year's Day 1801. In summary, and speaking only for our organization, I believe the function of our live music is to provide a certain atmosphere, "musical soundtrack," or even entertainment to an event at the White House, provide a ceremonial element to a military event, or to entertain and educate our audiences at public concerts. Peter: There have been quite a few over the years. As for sitting Presidents, I have played for George H.W. Bush, Bill Clinton, and George W. Bush. In addition, I have played for events at the White House that were attended by Presidents Nixon, Ford, Carter, and Reagan. One very memorable moment was playing the event at the White House near the end of President Bush's term in January 1993, when he awarded President Reagan the Medal of Freedom. President Reagan came over to the orchestra to say "hello" and had his hand on my shoulder during most of his remarks. Of course, perhaps the most significant encounter with a world leader happened in June 1992, when Russian President Boris Yeltsin reached out to shake my hand during the first Russian State Dinner following the collapse of the Soviet Union. More recently, when our string section steps out of the orchestra to provide strolling music in the Dining Room, I cover the tables of the President and First Lady. At nearly every dinner, the President leans in to me as I'm about to begin the last tune and says "Thanks a lot, big guy!" One night, he even whispered, "Don't break a sweat!" Laurie: What has been your most interesting or surreal moment in this job? Peter: Again, there have been many as you might imagine. Most recently, I led a string quartet at the State Department for the dinner in which the Kennedy Center Honorees were presented their awards. 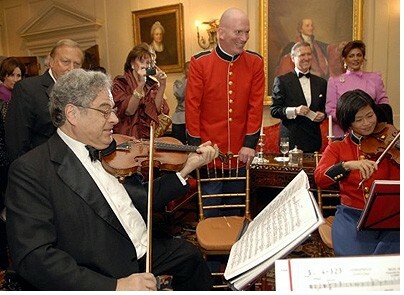 While providing receiving line and cocktail music, Itzhak Perlman and Yo Yo Ma approached and motioned to sit-in with the quartet. Our cellist and I surrendered our instruments, Perlman sat down and saw Gershwin's "I Got Rhythm" on my stand and promptly said, "Well, this won't work because I don't got rhythm!" So, I quickly flipped to an arrangement of Kreisler's "Liebesfreud" and they were off. While this would have seemed surreal enough, about halfway through the very hammed-up performance as I stood by, thrilled, I realized that Joshua Bell was standing next to me, having made his way over to the obviously engaged area of the room. I stood frozen for a moment. A great memory. Now I call my violin the "Ex-Perlman." Laurie: Have you ever traveled with the group to play in a war zone? Peter: I have not; however, it's interesting that you should ask that because our country music band "Free Country" (which I lead and serve as fiddle player) was scheduled to travel to Iraq in November and perform for several Marine battalions over Thanksgiving. This would have been an unprecedented tour for Marine Band personnel and it may still happen at some point, but certain logistical issues prevented this particular tour. If it does happen, I will no doubt feel emotions ranging from excitement to fear, but it will certainly be an honor and a privilege to give something back to those Marines who are serving and sacrificing so much for us. Laurie: Tell me a little bit about your CD. Is it mostly for fun? I do find it fun listening. Did you make the arrangements yourself? Peter: The CD "Bridging the Gap" is the self-titled album of the Violin and Double Bass Duo I founded with my good friend Aaron Clay. It was the result of a quick evolution of the duo that went from playing exclusively classical arrangements I had written of mostly violin and cello music or violin and piano music to jazz arrangements generated by Aaron. We quickly realized the almost unlimited potential of such a duo with regard to various musical styles and began writing even more arrangements of film music, folk tunes, and even funk. Aaron and I even began writing original compositions for the duo, since music for this combination is quite scarce. So, this first CD takes the listener on a journey through these various styles -- in fact Bridging the Gap between these instruments AND musical genres. The arrangements are roughly split down the middle between us. Is it fun? You bet. However, while we love the jazz and film arrangements, we are committed to performing serious concert works for this duo as well. In fact, a Double Concerto was composed for us (completed earlier this year) and we premiered it with the Marine Orchestra back in March. In addition, Northwestern alum Donald Womack composed a three movement suite for our duo entitled "Big Stone Gap." Laurie: Back to the Marine Band, are there currently any openings for violins? Peter: Actually we just filled THREE violin positions during the past year! However, it is possible there will be another opening in approximately four years. December 22, 2007 at 01:39 AM · Nice gig, Peter! Say, is that Erika Sato in the photo with Perlman? December 22, 2007 at 09:01 AM · Laurie, thanks so much for writing and posting this. The role of a Marine Corps violinist is interesting and different. Thanks for giving us a look into the life of a violinist in an uncommon role. December 22, 2007 at 03:23 PM · Thanks to you both for an interesting and unusual interview. December 23, 2007 at 03:07 PM · Thanks, Laurie. We have a good friend who retired recently from the Army Band. She had studied bassoon at Peabody. The military bands/orchestras are good gigs for musicians. The colleagues are excellent, the pay is good, and you have time for other activities. All of them look for string players. However, I think they tend to be a well-kept secret.